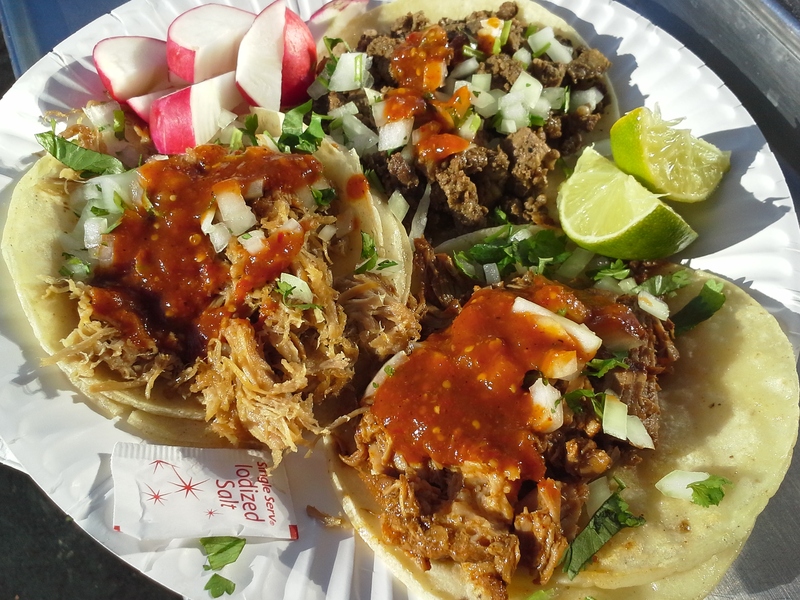 Finding a gas station taqueria is not an easy challenge in Los Angeles. When I was in Texas it seemed I’d find a gas station selling tacos about 1 out of every 15 stations, but here in my new (or is it old since I was born and raised here) city I’m finding the ratio is 1 out of every 100. The sparse finds are causing me to be a bit more loose with the definition of gas station taqueria. 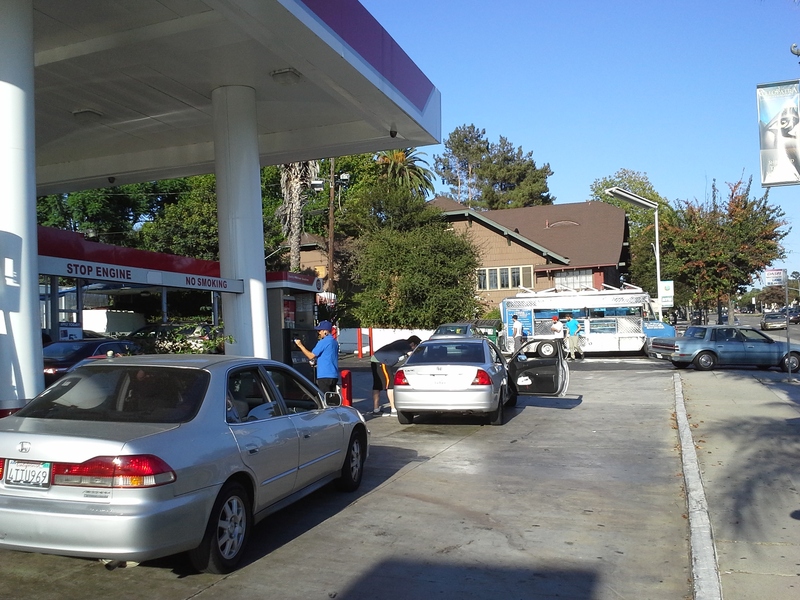 For instance, on our way to the Eagle Rock Farmers’ Market I drove past a Union 76 gas station with a blue and silver taco truck parked to the side of the pumps. Tacos La Estrella does park here regularly and is essentially a fixture of the gas station; though, as with anything with wheels it can simply decide to go elsewhere never to return again. 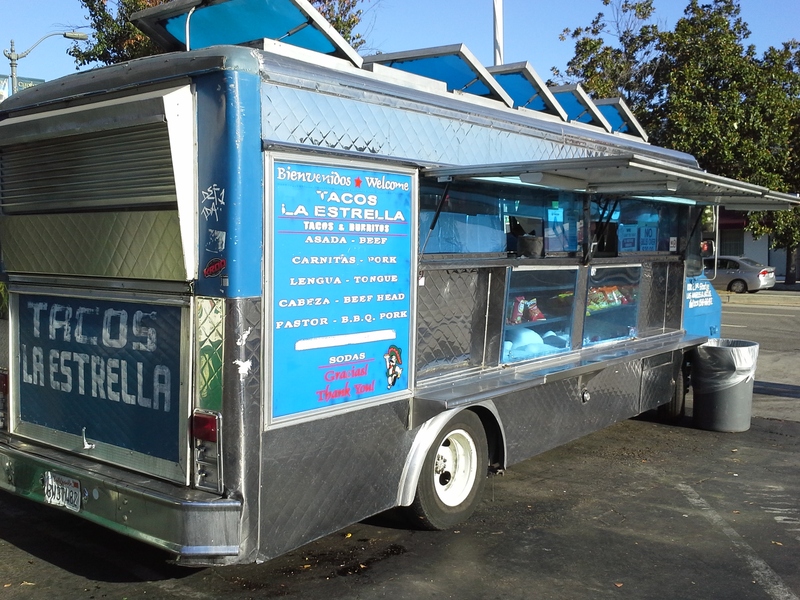 For now though, this taco truck spends a lot of time meeting the culinary needs of this gas station’s patrons and others who know of the truck’s taco superiority. I order a carne asada, carnitas, and al pastor all on corn tortillas with just onions and cilantro and salsa roja. The plate comes with California garnish of radishes and limes. When the tacos are served I can tell this was well worth the stop making up for the lackluster Eagle Rock Farmers’ Market which ended up being one of the most disappointing Farmers’ Market I’ve been to. All of the meats are cooked to perfection. Nothing is dry, overcooked or flavorless. Instead each bite is followed by an “yeah.” “mmmm.” “damn.” So I’ll never be doing food reviews for the New York Times, but who cares. I was loving these tacos. I polished them off in the car in about 2 minutes. My wife who rarely tries the tacos I eat from gas stations tried a bite of the carnitas and even she was impressed. The carnitas was really impressive, but that’s just because so many fail at overcooking carnitas making it tough and dry. Not here. After finishing my diner, it was time to take the family out to eat. Sadly no one else wanted tacos so we ended up at California Pizza Kitchen. I ordered a beer and a salad while everyone else ordered their meals. I surveyed the restaurant thinking about the amazing tacos I just enjoyed a few miles west wishing I had a few more to go with the beer.